The Medieval period saw major technological advances, including the invention of vertical windmills, spectacles, mechanical clocks, greatly improved water mills, building techniques like the Gothic style and three-field crop rotation. 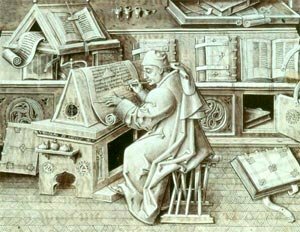 Between 1000 and 1300 AD this period also saw the birth of medieval universities, which benefited materially from the translated texts and provided a new infrastructure for scientific communities. By the 6th century teaching and learning moved to monastic and cathedral schools. The center of education was the study of the Bible. Education of the laymen survived in Italy, Spain, and the southern part of Gaul, where Roman influences were most long-lasting. In the 7th century, learning began to emerge in Ireland and the Celtic lands, where Latin was a foreign language but were eagerly studied and taught. 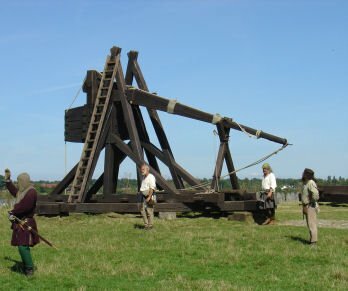 Counterweight trebuchet (12th) - Gravity powers these weapons revolutionized medieval siege weapons by use of counterweights allowing it to hurl huge stones very long distances. It was first used in the eastern Mediterranean basin. 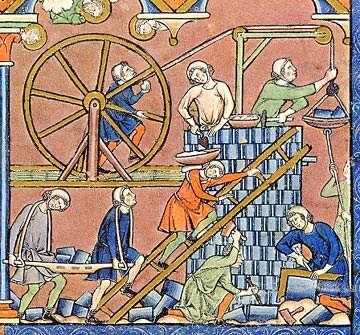 Trebuchets were used in the Crusades by the 1120s, Byzantium by the 1130s and in the Latin West by the 1150s. Longbow with massed, disciplined archery (13th) - The Longbow was powerful, accurate and contributed to the eventual demise of the medieval knight class. It was used by the English against the French during the Hundred Years' War (1337-1453). Steel crossbow (14th, late) - The first hand-held mechanical crossbow, this European innovation Came with several different cocking aids to enhance draw power. Large and appear by the end of the 14th century. Heavy plough (5th - 8th) - The heavy wheeled plough first appeared in Slavic lands before it came to Northern Italy (the Po Valley). By the 8th century it was used in the Rhineland. The Heavy Plough was important in cultivation of the rich, heavy, often wet soils of Northern Europe. Horse collar (6th - 9th) - The Horse Collar went through multiple evolutions from the 6th to 9th centuries. It allowed more horse pulling power, such as with heavy ploughs. Horseshoes (9th) - Horseshoes let horses adapt to rocky terrain, mountains and carry heavier loads. They may have been known to the Romans and Celts as early as 50 BC. Artesian well (1126) - A thin rod with a hard iron cutting edge is placed in a bore hole and repeatedly struck with a hammer. Underground water pressure forces the water up the hole without pumping. Artesian wells are named for Artois in France, where the first was drilled by Carthusian monks in 1126. Wheelbarrow (1170s) - Useful in construction, mining, and farming. Wheelbarrows appeared in stories and pictures between 1170 and 1250 in North-western Europe. First depiction in a drawing in the 13th century. Blast furnace (1150-1350) - Cast iron first appears in Middle Europe around 1150. The technique was considered to be an independent European development. Hourglass (1338) - A dependable, affordable and accurate measure of time. The instrument isn't liable to freeze as other time measurements systems of the time did. Hourglasses are a medieval innovation first documented in Siena, Italy. Mechanical clocks (13th -14th) - A European innovation, these weight-driven clocks were used primarily in clock towers. Plate armour (14th, late) - The best in personal armour in terms of body protection and the skills involved in working metal. Large and complete full plates of armour appear by the end of the 14th century. Vertical windmills (1180s) - Invented in Europe as the pivotable post mill it was efficient at grinding grain or draining water. The first mention of one is from Yorkshire in England in 1185. Spectacles (1280s) - From Florence, Italy, convex lenses to help far-sighted people. Concave lenses fro near-sighted people weren't developed before the 15th century. Spinning wheel (13th) - Brought to Europe probably from India. Mirrors (1180) - First mention of a mirror was made in 1180 by Alexander Neckham who said "Take away the lead which is behind the glass and there will be no image of the one looking in." Oil paint (ca. 1410) - As early as the 13th century by Flemish painter Jan van Eyck around 1410 who introduced a stable oil mixture. Oil was used to add details to tempera paintings. Quarantine (1377) - Initially a 40-day-period, the Quarantine was introduced by the Republic of Ragusa to prevent the spreading of diseases like the Black Death. Venice began quarantines, then the practice spread around in Europe. What do you think is the coolest invention from the Middle Ages? Why do you think it's so great? Did it make the poor people's lives way better, or did it make the rich richer?